Almost everyone loves the smell, look, and taste of freshly baked pie. But as pleasant as pie can be, making this delicate pastry can often seem like more work than it's worth. This causes some to give up entirely, and resort to store-bought desserts that don't have half the flavor. Knowing exactly how long the pie needs to bake for, and how to tell when it's done, is essential and a few simple guidelines take almost all the guesswork out of making scrumptious pies. 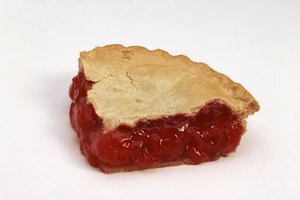 There are dozens of things that can affect how long a pie should bake, including the size of the pie, the specific filling in use, the temperature of the oven, altitude, and more. But above all, the most crucial characteristic is the kind of pie you're baking. Different kinds of pie require very different cooking methods and instructions. Generally, most pies can be divided into three groups, each of which merit their own instructions. These groups are: single crust pies, pies with pre-baked crusts, twice baked pies, and filled pies with both a top and bottom crust. Recipes for single crust pie are often the simplest, as they involve mixing ingredients, pouring them into an unbaked pie crust, and putting them in the oven. This includes chess pie, and some recipes for pecan and similar fillings. For these sorts of recipes, your oven temperature will typically be between 375 and 425 degrees, and your cooking time will range from between 35 minutes to 1 hour and five minutes. For many pies, the crust is the only part that actually needs to bake. This is especially true for many cream pies, whose fillings are refrigerated. If this is the case, then you need to bake the crust completely through before you do anything else. Cover the crust in foil, and bake in a 375 degree oven for about 25 minutes, then remove the foil and cook for about another 10, or until the crust is a deep golden brown. 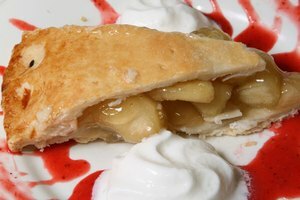 Many experts such as America's Test Kitchen recommend weighing down the empty crust with pie weights or pennies, to make sure no bubbles form during the cooking process. For twice backed pies, the crust is baked partially, then the filling is added and the entire pie is baked again. Start by covering the empty crust in foil and weighing down the center with pennies. Bake the empty crust at 375 for approximately 25 minutes. Then add your filling, and rebake the pie until completely ready, usually another 25 minutes. Perhaps the most common type of pie, and the most beloved are those with both a top and bottom crust. This includes whole top crusts as well as lattice-top pies. For these pies, the temperature again needs to be between 375 and 400 for most recipes. Cooking times can range significantly, but most recipes call for between 45 minutes and 1 hour, depending on the size of the pie and its filling. No list of times is ever completely foolproof, so it's important that you know how to identify when your pie is ready. The first indicator is the crust, which should ideally be a rich golden brown color on both the top and bottom, which you can see by using a glass pie plate. The fillings of pies are a little harder to judge, but there are visual cues you can look for. Fruit pies should generally be bubbling; pies like pumpkin and pecan are done when the center sets and does not jiggle when you gently shake the glass pie pan. Some recipes can be tested for doneness by inserting a toothpick near the center, which should come out almost clean when the pie is ready. Check your specific recipe for guidelines, and be sure to check diligently during the last few minutes of cook time. That way, you can be sure to get great results every time. 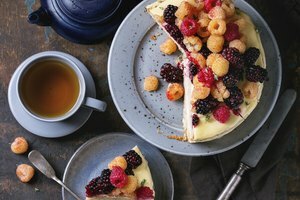 How Full Should I Fill a Cake Pan?